And I don’t understand this either. This is The Duck’s. Yes, that’s what it’s called. The Duck’s. Terrible isn’t it? How are you supposed to ask for that at the bar? ‘‘Give me a The Duck’s.’’ ‘‘Can I have a schooner of The Duck’s please?’’. It’s just impossibly awkward to say. 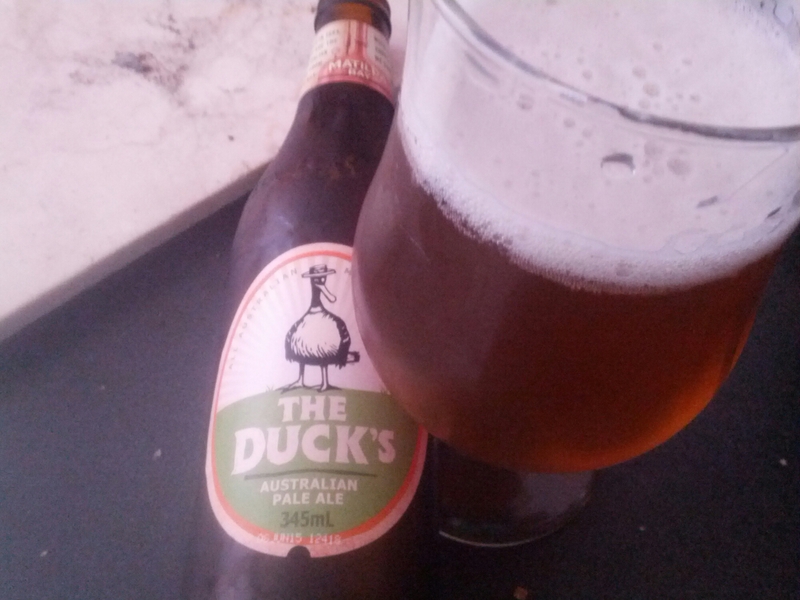 It’s the latest beer from Matilda Bay and it’s a pale ale. Their fourth pale ale – after Alpha, Fat Yak and IGP. There could even be more but they’re the only ones I know of. I don’t understand why one brewery needs four pale ales. Nor do I understand why it needs a beer that effectively undercuts its mainstreamer in Fat Yak. Now, unlike a lot of beer geeks, I really like Fat Yak. It’s a easy drinking beer with a little fruit flavour going on. I even bought that 10-pack of cans and enjoyed myself every single time I cracked one open. And to the best of my knowledge Fat Yak sells reasonably well. But The Duck’s is much less flavoursome than Fat Yak. And I refuse to believe there are people out there who try a Fat Yak and go ‘‘wow, that’s too much for me. I wish they would make a beer with less flavour for people like me’’. Sure the label description would have you believe there is so much going on here. I have to say I don’t think I’ve disagreed more with a label description in my life. If there are Galaxy and Summer hops it must be just one hop pellet of each because I couldn’t smell or taste any fruit, spice or pepper. Nor did I get a zesty finish. And I certainly wouldn’t reach for one on a hot summer’s day. For that, there are far better Matilda Bay options – like Fat Yak and Minimum Chips (yeah, I know geeks hate it. But jeez, it’s refreshing. And if I drink it from a glass I don’t need to look at that dumb name. Minimum Chips? Why pick a name that makes no sense to half the country?). I don’t understand why , instead of releasing a pale ale that is sure to just cannibalise their other pale ales, Matilda Bay didn’t instead bottle one of their older beers. They could have kept with the Duck theme and bottled Barking Duck, a saison I’ve heard so many people rave about but never had the chance to try myself. Release that sucker and then Matilda Bay becomes immediately interesting to a lot of people. ‘‘The craft arm of a mainstream brewer is releasing a saison? Wow, I want some of that’’. But no, instead of surprising us with something different, they give us more of the same. I just don’t understand it. In closing, why is this beer of the week if I don’t like it? Well, the beer of the week is for those that I had and thought were noteworthy. And that can be for good reasons or not so good reasons. I’ve only had the IGP the once and can’t recall exactly how it tasted. So it didn’t really leave much of an impression on me one way or the other. I like Fat Yak so I’m sure I would have noticed any similarities.